2Ankara Üniversitesi Eczacılık Fakültesi Eczacılık İşletmeciliği Anabilim Dalı DOI : 10.12991/mpj.20151935489 Organizations" being able to pace with time and success by providing a competitive advantage in sector that they show their activities, are closely related to their managers" being a leader, their behavior and attitudes. In the pharmaceutical sector, which is the component of the health sector having a vital output, this case has a special importance. The leadership behaviors that are examined within the frame of Characteristics Approach, Behavioral Approach and Situational Approach at the beginning, were replaced by the modern approaches in due time. Ohio Leadership Studies that take place in the behavioral approach is the basis of 360o Performance Evaluation System which is being used today. Developed within this frame and taking place in the questionnaire performed within the frame of the dissertation study, Leadership Behavior Description Questionnaire is a scale adapted to Turkish by Ergun. 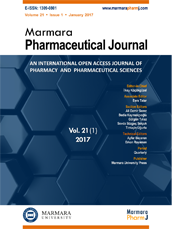 In this study, a survey that includes these scales and questions for receiving various basic information have been applied to managers of the pharmaceutical companies which are the members of the AİFD, İEİS and TİSD and operating in Turkey to determine their leadership approaches.